Top 10 Best Car Perfumes in India 2019 - Top 10 In India - Only The Best of everything! LATEST product list, updates regularly! A good car perfume is really a blessing for your car. Every one of us wants our cars to smell good. It is easy to choose the first perfume you come across for your car, but that will not fulfill your purpose completely. What we suggest is that you keep a few points in mind before buying a car perfume. You may think that once the perfume is over you can just buy another perfume with another fragrance and change it. However, the perfume you put in the car remains even after you take it away. It seeps into the rest of the car, so mixing perfumes will never give you the best or purest aromatic experience. It is better to choose your overall fragrance and try to stick with it. The Gel car perfumes, with longest lifespan, last considerably longer than the hanging type (shortest life span). A good car perfume can remove bad odour very efficiently. Whether it is from outside the car, or the dank smell in the car or any smell from food or perspiration etc. a good car fragrance can take care of it all. It can make any journey much more enjoyable. Here are a few choices of car fragrances that our staff have selected after using in their cars, that you can buy and use them in your car right away. 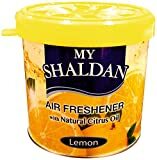 This car fragrance lasts 60 days and comes from the renowned and trusted Godrej company. It is very easy to use and is one of the most popular in India right now. Good - It is a very soothing and gentle perfume that calms you and puts you in a good frame of mind. Bad - The construct of the car fragrance is not very good. The container is difficult to twist sometimes at it is made from a low quality plastic. This car air freshener has a sweet smell and completely transforms the interiors of the car. It has a distinct aroma that evokes a feeling of fresh energy. Good – A great aroma that can really change the mood of the car. Bad – The fragrance does not last as long as some other car perfumes. 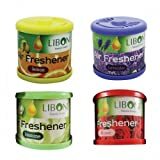 This squash scented car freshener is in a gel form, so easier to use and manage. The aroma is very refreshing and the citrus-sy hint is a great to get you going. It is also made from natural fragrances. Good – The smell is distinctly refreshing and rejuvenating. Bad – The so called adjustment to increase and decrease the fragrance with the lid is ineffective. Here are some tips to keep in mind while choosing a perfume for your car. 1. First of all, the fragrance should be liked by every one who will be traveling in the car. Sometimes, one kind of smell might appeal to some of us, yet be unbearable for other people sitting in the car. 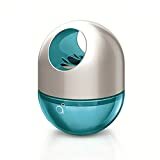 So the best situation is to choose a car perfume that is pleasing to all the people who are going to be using the car regularly. Imagine being boxed into the car and having to bear with a perfume that you absolutely hate! So, speak to all the people who use the car and get an idea of what perfume to avoid. 2. The second point that needs to be kept in mind is about the physical construct of the device holding the car perfume. In most cases we need to twist the top of the device containing the car perfume to spread the fragrance. A car perfume with good built quality will make this process east, and the twisting will happen seamlessly. Ideally you should choose a car perfume set up with an easy to use twist mechanism for controlling the flow of fragrance. 3. A car perfume with a good gel technology is a must. Gel technology is basically a system that prevents any leakage of the perfume, making it spill-proof. This is clearly more necessary on roads where there are more chances of the car jerking and jolting, causing the car perfume to leak or spill. And roads in India can be very rough and uneven! 4. Another point is, that you may find a car perfume that really pleases you, but it hardly lasts. Try to find out how long the perfume will last, and go inf or a long lasting car perfume set. 5. Buying a car perfume that belongs to a reputed brand is the safest bet. 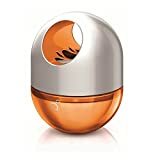 Although, at times the fragrance of a car perfume from an unknown brand might impress us, but then there are many other factors apart from the fragrance that should be considered before buying one. After all, a car perfume is an elegant thing that adds great value to the overall ambiance inside a car. Thus, it is always better to go with a brand that has proved itself in all departments to earn an identity of being the best. 6. Since the advent of online shopping portals and online reviews of products, thorough research before buying anything has become a norm. The same thing applies to a car perfume as well since we are not buying it just for a week or two but for more than 2 months. Thus, it is very necessary to read the reviews of a car perfume that we choose to buy. 7. The car perfume needs to be securely placed inside the car, so pay a little attention to how the perfume will be placed in the car. To start your search for the best car perfume, just have a look at the list of the Top 10 Best car Perfumes in India below. Can we tell you exactly what perfume will be best for your car? Probably not. After all perfumes are all about personal taste, and preference. However this list of the top bestselling car perfumes will give you just the right options to make a good choice. Each one of these perfumes has been bought by thousands of people, and they are from good brands. 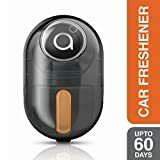 The list of the Top 10 Bestselling car perfumes in India is also updated every day so that you get the latest brands and perfumes that are in the market. This makes the top 10 best car perfumes the ideal choice if you find one with the fragrance and price that you are looking for. Of course you can be very sure of the fact that choosing from www.top10in.in, means getting a good and reliable product. So, take your pick from these top selling car perfumes and enjoy the drive! The Involve car perfume is a great choice because it is a perfume cake. 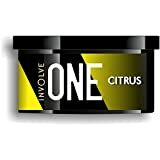 That means no spilling and a great fragrance that spreads evenly without needing to twist the cap or do anything bothersome. A great tip to make this affordable and very good aroma perfume last much longer is to do the following. One of the people who used the Involve Musk perfume, did this to make the car perfume last for two whole months. The first step is to not completely open out the cover of the perfume cake. Start by opening out half the cover. This will keep the car smelling great for about 20 days. Next remove the full cover of the car perfume cake. This will give the car another 15 days of lovely fragrance. Finally you just need to reverse the deodorizer which will then last for another 15 days or so. That will give you about two months of excellent perfume from a great product. 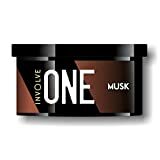 You can check it out here – Involve Car Perfume on Amazon India.